San Francisco (Obama.net)- As previously reported, a Muslim community center and mosque are to be constructed in lower Manhattan near the location where the World Trade Center used to stand before the attacks of September 11, 2001. Imam Feisal Abdul Rauf is the man behind the plan, who chose the location and is funding the construction. President Barack Obama has openly said that he will not comment on the wisdom of the choice to construct there, but that the organizers of the community center and mosque have every right in the United States to build there regardless of uneasiness it may bring as people are already relating it to the 9/11 attacks. 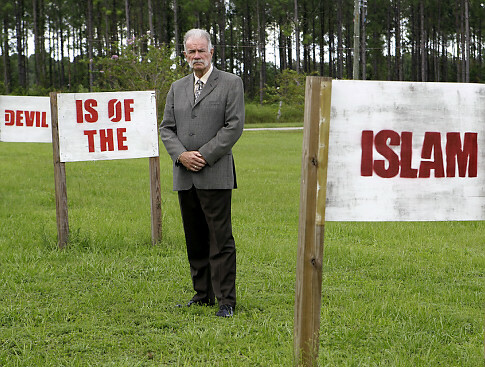 Florida Reverend Terry Jones is one of those people who are completely against the idea. Reverend Jones planned to organize a Quran burning on September 11th as both a way to mark the anniversary of the 2001 attacks and as a way to lash back at Rauf and his plans. Jones said Thursday that he has canceled the plan to burn Qurans. He said that he will instead travel to New York City to speak in person with Rauf in order to convince him to not build in the location and to move his center and mosque elsewhere. However, Rauf said that while he is happy that Jones is no longer going to burn copies of the Quran, he has no intentions of negotiating the location of his center as he is building it for the sole purpose of a peaceful location where Muslims can come together and celebrate their religion and its practices. Jones is still asserting that he has been told the mosque will in fact be moved out of the current location. Reports say that Jones has yet to speak with Rauf and has not been given any indication that the center will be moved. Obama is pleased with the cancelation of the burning of the Qurans. Obama and his administration expected that any organized burning of Qurans in the United States would certainly result in an uproar in the Middle East, which would in turn likely increase the strength of al Qaeda to recruit new members. Despite Jones intentions to make the point that building a Muslim mosque near ground zero is possibly insensitive, Jones’ retaliation of threatening to burn Quran’s is without question insensitive, offensive, intolerant, and a complete disregard of the American right to practice religion freely.